The first digital magazine cover hit the newsstand this week as the Ford moved to promote its new vehicle, the Flex. Overall, I think the treatment is well done especially from the front cover perspective when you see it against all of the static magazine covers. Though I wonder if other magazines adopt this concept your daily bookstore will start to look like Time Square? Bad thing? Probably not, certainly would make the bookstore window compelling at night. 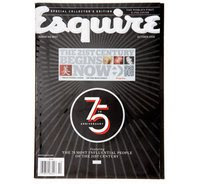 The connection with Esquire was around the magazine's 75th anniversary with the tag line "The 21st century begins now." Oh well, I guess Esquire is 8 years late but who cares it's advertising and we can define when things start. Right!? Unfortunately, the impact isn’t as positive for the sponsor of the ad – Ford. The Flex image on the inside of the cover does a three light ‘dance’ that really isn’t as compelling as the billboard text implementation on the front cover. However, the creative is inline with the Flex’s overall dark, techie, electrifying campaign look and feel. So, it is on message. Overall it is an interesting concept and attempt at buzz. Regarding buzz: Some heard about the upcoming “E-ink” cover and wrongly thought of it as something that could be changed or would resemble some of the E-ink reading tablets out on the market; instead, it was simply a bit of electronic billboard motion. That said, reception has been positive in media circles and less positive by technocrats. Personally, I think it is similar in fashion to the recent BMW 1-series ad, it is an unique approach to traditional media and plays with what is traditionally a marketing free zone --the front cover -- in a new way that breathes some life into declining interest in magazines.